PROVENANCE: A private family collection. 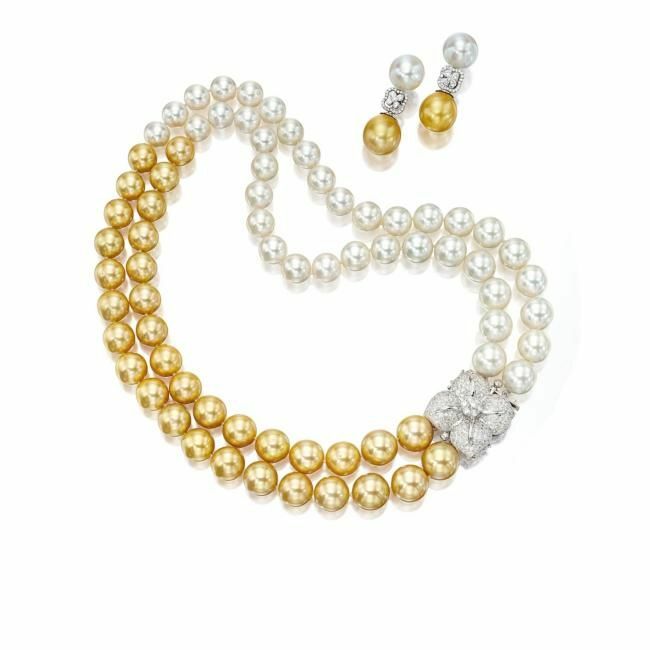 Christie's Hong Kong, 27th November 2007, lot 1861. PROVENANCE: Collection of L. de Luca, 1900 (according to inscription). 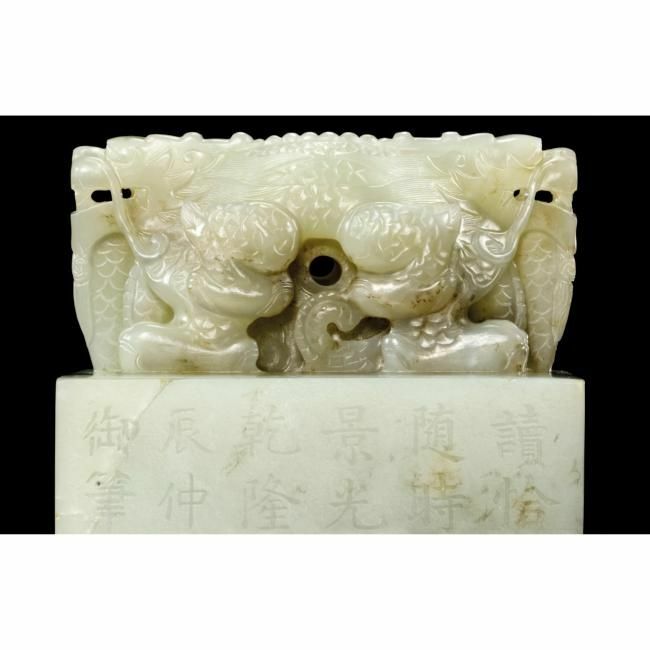 NOTE: The Qianlong emperor's penchant for the antique saw a great number of copies of ancient jades and archaistic carvings to be produced during his reign. This expertly carved piece is based on the bi, an ancient ritual disc that according to Han ritual texts and commentaries symbolised Heaven. 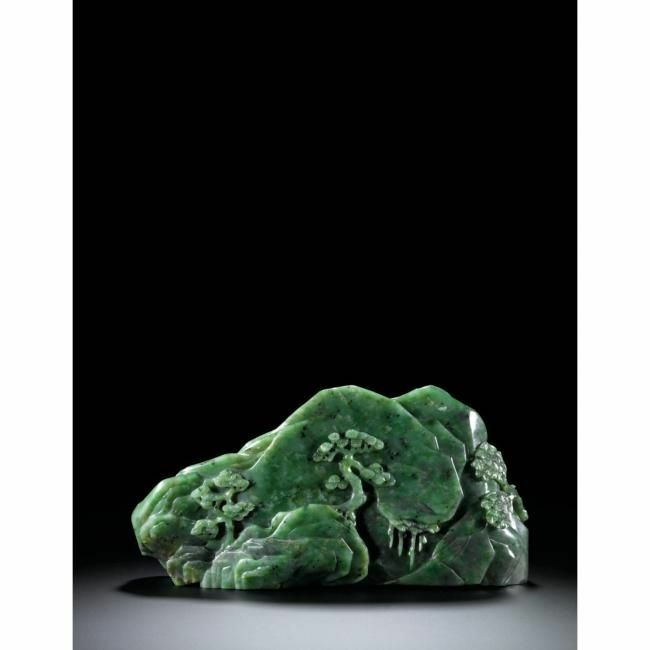 Although this piece was not intended to serve any ritual purpose, under the Qianlong emperor jade discs continued to be associated with Heaven and were seen as a symbol of power and the Emperor's appreciation of antiquity. A closely related example mounted in a very similar album, but illustrating a leafy bamboo branch, in the Qing Court collection and still in Beijing, is published in The Complete Collection of Treasures of the Palace Museum. Jadeware (III), Hong Kong, 1995, pl. 127; another, with the album illustrating a marigold, was sold in these rooms, 27th April 2003, lot 3, and was included in the exhibition A Romance with Jade from the De An Tang Collection, Palace Museum, Beijing, 2004, cat. no. 21; and a third example, but lacking the album, in the Fitzwilliam Museum, Cambridge, is included in James C.S. Lin, The Immortal Stone. 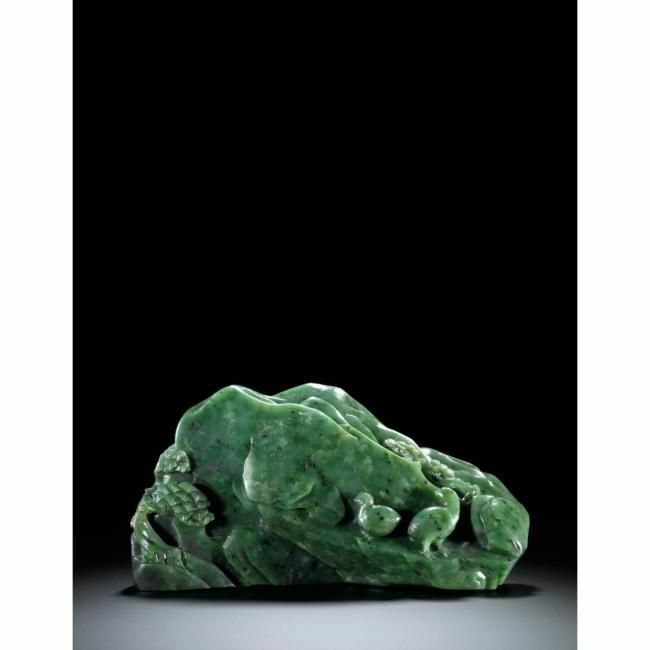 Chinese Jades from the Neolithic Period to the Twentieth Century, Cambridge, 2009, pl. 77a and b. For the prototype of this bi, see a large disc decorated with a pair of dragons in ornate openwork excavated in the tomb of Liu Sheng (d. 113BC) at Mancheng, Hebei province, illustrated in Zhongguo meishu quanji yuqi, vol. 9, Beijing, 1991, pl. 164. 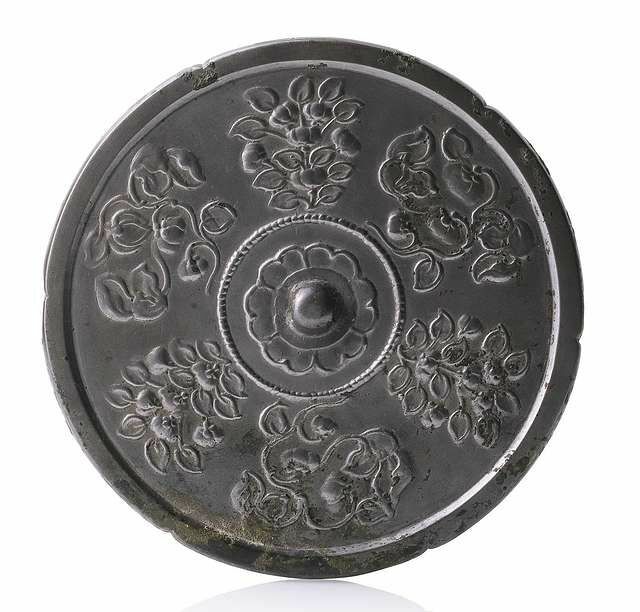 See also another bi attributed to the Eastern Han dynasty (AD25-220) similarly carved with chilong flanking the characters chang le ('happiness') in openwork carving above a disc, in the Qing Court collection and still in Beijing, included in The Complete Collection of Treasures of the Palace Museum. 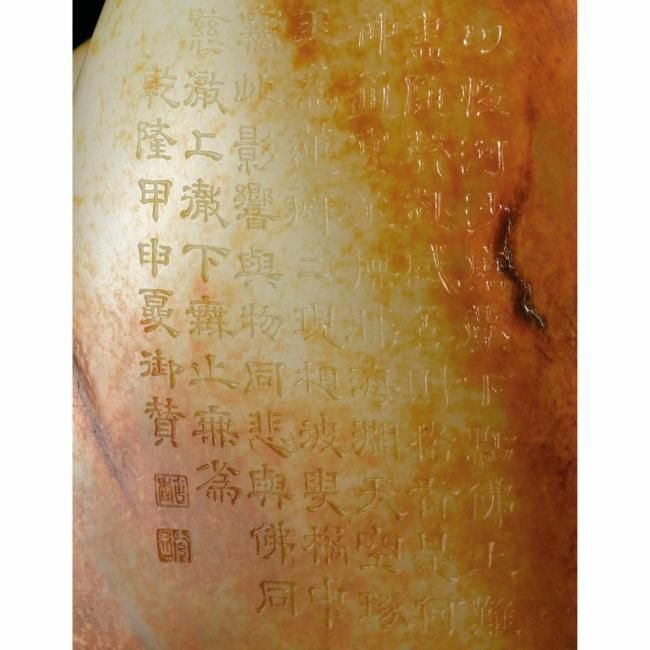 Jadeware (I), Hong Kong, 1995, pl. 217; together with a jade bi carved with a dragon and two phoenixes, attributed to the Western Han dynasty (206BC-AD9), pl. 215. 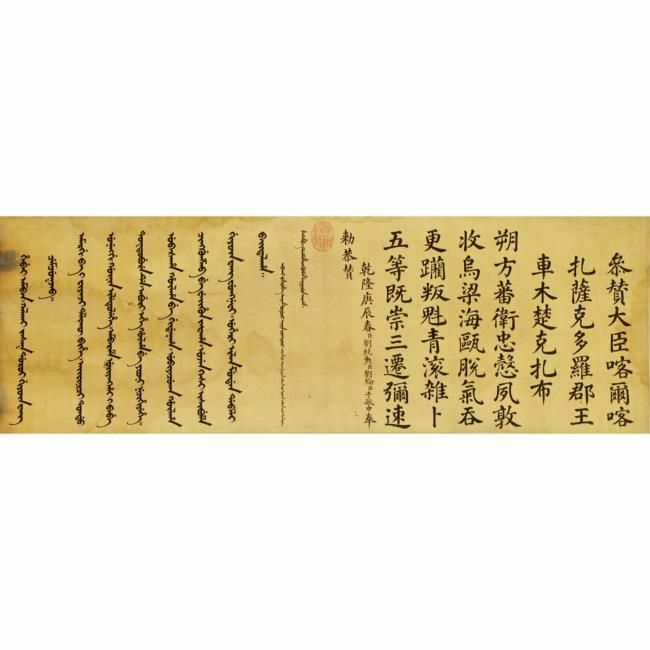 EXHIBITED: Die Bilder für die Halle des Purpurglanzes: Chinesische Offiziersporträts und Schlachtenkupfer der Ära Qianlong (1736-1795), Museum für Ostasiatische Kunst, Berlin, 2003, cat. no. 4. LITERATURE AND REFERENCES: Charles R. Bawden, 'The Mongolian rebellion of 1756-1757'. Journal of Asian History 2. 1968, pp. 1–31. 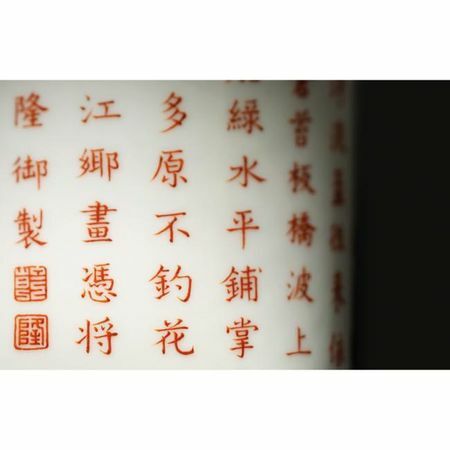 Hartmut Walravens, 'New material on the portraits of meritorious officers of the Qianlong campaigns', Historical and Linguistic Interaction Between Inner-Asia and Europe, Szeged, Hungary, 1997 (Studia uralo-altaica 39), pp. 401–423. Nie Chongzheng, Tan Ziguangge Gongchuan Xiang ['A discussion about the meritorious officers paintings of Ziguangge' (Hall of Purple Splendour)], Beijing, Zijincheng, 156.2008, pp. 138–169, esp. 151–152. 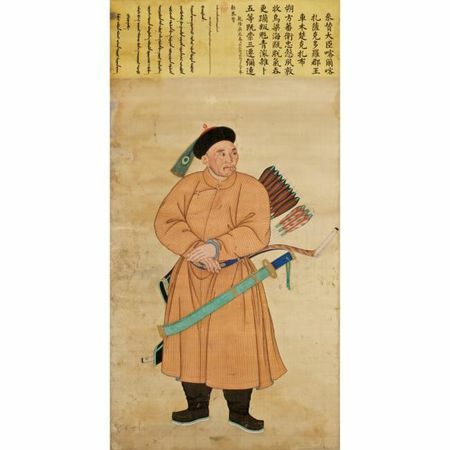 NOTE: This painting shows Cemcukjab (d. 1776), a commanding offficer of the northern borders of the Qing Empire, whom the eulogy describes as a meritorious officer of loyal and upright character who played a pivotal role in bringing peace to the area of Urianghai by completely subduing the robbers and capturing the rebel-chief Cinggunzab alive. For his bravery and military ability he was granted special favours and made a Prince of the second degree. 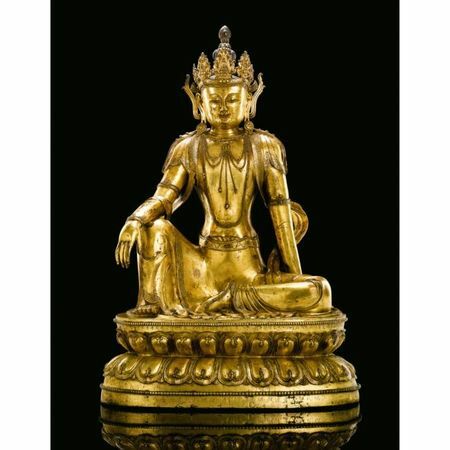 The councilor to the government, the Manchu Prince second degree, Kalka-Jasak Cemcukjab. 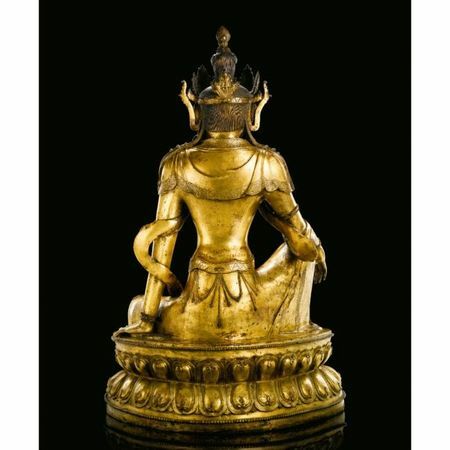 He was the protector and shield of the North, always demonstrating loyal and upstanding character, largely bringing peace to the area of Urianghai by completely subdueing the wicked and evil robbers. He took the rebels by surprise, captured the heinous robber Cinggunzab [in Mongolian: Činggüncab] alive, after which he was granted special favor and made a prince of the second degree. He was altogether promoted thrice, in quick succession. In [gengchen] 1760 the officials Liu Tongxun , Liu Lun and Yu Minzhong received the imperial command to respectfully compose this eulogy. 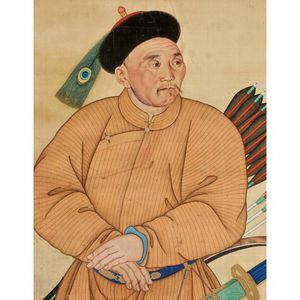 Bannerman Cemcukjab distinguished himself in the Eastern Turkestan campaign (Xinjiang 1755-59), one of the major victorious campaigns of the Qianlong emperor where he sought to control the Dzungar state and secure the boundaries of Chinese Turkestan. This campaign helped eliminate Dzungar rivalry for control over the Dalai Lamas in Tibet and led to the pacification of the Islamicised, Turkic-speaking southern half of Xinjiang, thereby securing Qing imperial control over the vast region of Inner-Asia. The present portrait is the sixth painting from the second series of bannerman paintings created in 1760. The eulogies of the second series of portraits were composed and written by the eminent officials Liu Tongxun, Liu Lun and Yu Minzhong. The painting shows Cemcukjab in his prime wearing a light brown striped surcoat and a single-eyed peacock feather attached to the back of his black fur-trimmed winter hat, an imperial gift bestowed only to officers who had distinguished themselves in a military campaign. His naturalistically rendered weathered face is depicted in three-quarter view, which is characteristic of this type of traditional Chinese portrait painting. The thick ink brushstrokes outlining the body and the vivid palette are typical of the painting style of the imperial academy of the 18th-century. A close look at the face reveals the influence of Western painting techniques introduced by Jesuit missionary artists at the Qing court. The modelling of the face is intense and naturalistic, especially in the eyes that are painted with white specks. It is interesting to note that while professionally cleaning this painting, it was discovered that the figure's name was inscribed on the silk beneath the face. This supports the theory that the court artists painted the body, while the faces were left to the Jesuits to paint. In order not to wrongly match up heads and figures the person's name was written in the place where the face was to be later inserted. For further information on bannerman paintings see Nie Chongzhen, 'The Newly Discovered Bannerman Painting of Yisamu from Ziguang Pavilion', Imperial Peking. The Last Days, Sotheby's, London, 2007, pp. 112-3. Various such paintings have been sold in our rooms; see a painting of the Bannerman Zha Er Shan, from the same series as the present one, sold in London, 13th May 2009, lot 136; and another of the Bannerman Yisamu, attributed to Ai Qimeng and Jin Tingbao, sold in Hong Kong, 9th October 2007, lot 1314, together with portraits of Bannerman Tanibu, lot 1315 and Bannerman Dalhan, lot 1316. Further bannerman portraits include that of Hu Er Cha Ba, sold in New York, 3rd June 1986, lot 90; of the General Fu Heng, also sold in New York, 23-25th April 1987, lot 56; and a set of ten paintings from a handscroll of fifty paintings of bannermen by Jin Tingbao, also commissioned by the Qianlong emperor in 1769, again in New York, 31st March – 1st April 2005, lot 280. A group of bust-size oil paintings can be found in the Museum fur Volkerkunde, Staatliche Museen in Berlin, illustrated in Herbert Butz et al., Bilder fur die 'Halle des Purpurglanzes'; Berlin, 2004, pls 12-17. Imperial bannerman paintings were housed in the Ziguange (Hall of Purple Splendour), a hall of fame for immortalised heroes, located in the West Garden of the Imperial Palace precincts in Beijing. PROVENANCE: Sotheby's Hong Kong, 16th November 1983, lot 383. What numinous power she must have! Each and every petal clearly defined. Could have taken their cue from this. Ever unceasing and ever unconditioned. 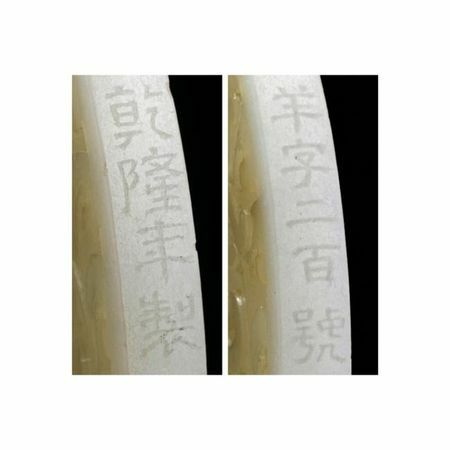 The present carving is unusual for its depiction of the figure of Guanyin and the three oval-section shape, and no other example appears to have been depicted. 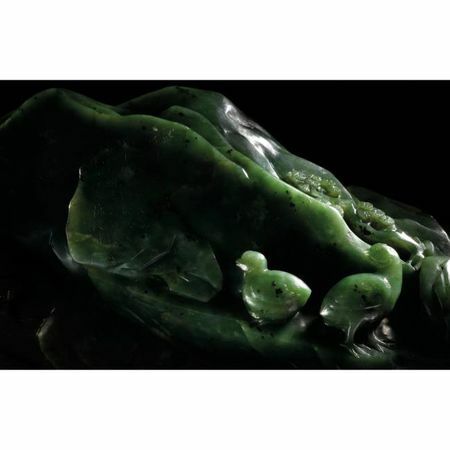 The proficiency of the carver is revealed in the clever way in which the natural shape and russet skin colour of the stone have been manipulated to create an intimate enclosure that exudes a sense of calm befitting to Guanyin. 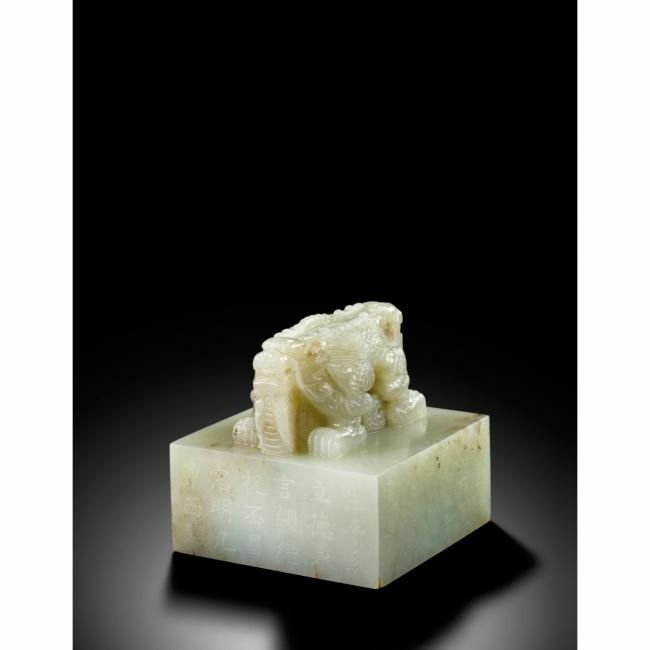 Jade carvings depicting figures in naturalistic settings and modelled in the round with elaborate detail were particularly popular with the Qianlong emperor who was a keen collector of jade artefacts. 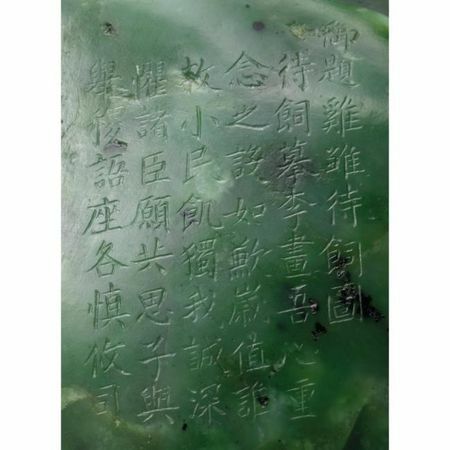 All jade pieces in his collection were carefully chosen or commissioned by him, and only those that were of particular significance were endowed with his inscription or appraisal. Such carvings would have been housed in the Palace for his enjoyment and appreciation. 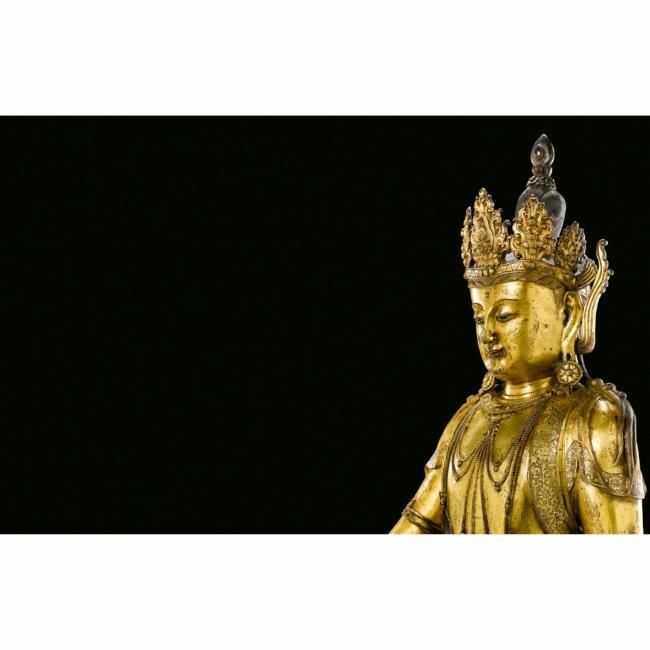 For carvings of figures in oval-shaped grottos, see one enclosing a figure of the Buddha sold in these rooms, 23rd October 2005, lot 414; and another depicting Damo, inscribed with an Imperial poem and dated to 1772, sold at Christie's Hong Kong, 1st May 1995, lot 801. Or, free from care, just go fishing, gather firewood. I'd rather linger here surrounded by such scenery. Since I myself cannot conjure up mists and clouds. Is now red steam for a whole stretch of rosy clouds. And for fond guests I take my time over brewing tea. He always sends it off to some mountain recluse. Blue-green pines thrusting up above their company. Stream a dark sash which seems to split. Where I myself light a famous brand of incense. And the Milky Way shines faintly through thin clouds. A summer pavilion open to the willows. And call to the boy to wash my cup clean. Half because I so love its deep green moss. On which those in clogs seem walking in a boat. And when blossoms fall they only can pity each other. Depend on it to banish all vulgar thought. In their search for ever new designs and styles for the Qianlong emperor, the porcelain painters of the imperial kilns sometimes took the unusual step to reduce rather than to enlarge their choice of colours and decorative techniques from the plethora of possibilities at their disposal, yet while still producing subtly unique pieces. This is the case with the present brushpot, which at first glance appears familiar with its elegant imperial inscription on a cylindrical white form; however brushpots enamelled with iron-red inscription are rare. Two closely related examples, but inscribed with different poems, were included in the exhibition The Sun Yingzhou Collection of Chinese Ceramics, Palace Museum, Beijing, 2003, cat. nos 161 and 162. 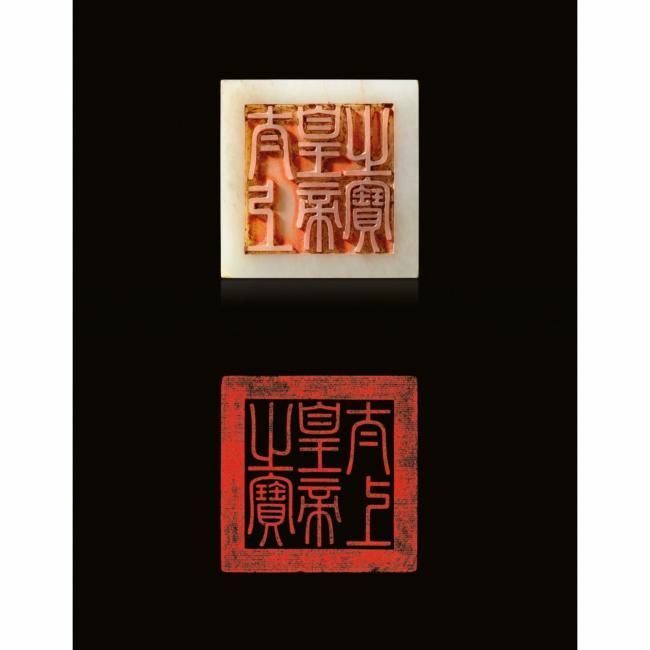 Compare a Qianlong mark and period brushpot of similar form and size, but the poetic inscription written in black enamel, sold in these rooms, 5th November 1996, lot 921; and another but supported on five feet, in the National Palace Museum, Taipei, included in the exhibition Stunning Decorative Porcelains from the Ch'ien-lung Reign, National Palace Museum, Taipei, 2009, cat. no. 58. Inscriptions in underglaze blue frequently adorned brushpots during the Kangxi reign (1662-1722) and this style of decoration was revived under the Qianlong emperor, but more frequently in black enamel on a variety of wares including brushpots, teacups and teapots. For the possible inspiration for the present brushpot, see a Kangxi example of broad proportions inscribed with a hundred shou characters in underglaze red, illustrated in The Complete Collection of Treasures of the Palace Museum. Blue and White Porcelain with Underglazed Red (III), Shanghai, 2000, pl. 166. 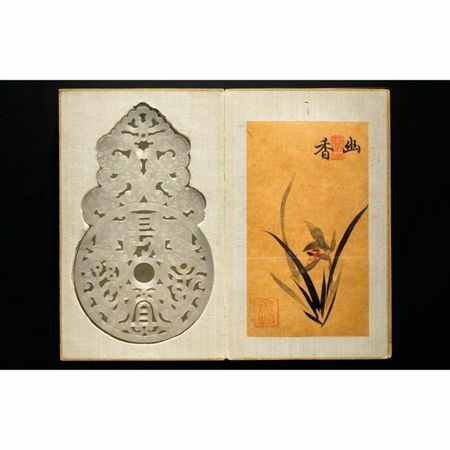 EXHIBITED: Chugoku Bijutsu ten series 5 (Chinese Art Exhibition Series 5) Minshin no Bijutsu ('Arts of Ming and Ch 'ing Dynasties'), Osaka Municiple Museum, Osaka 1980, cat. no. 3-15. 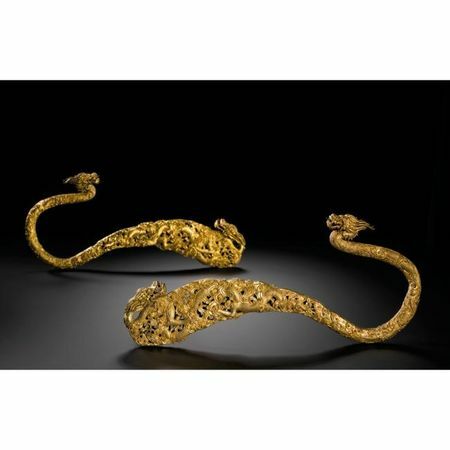 NOTE: Exquisitely cast in openwork to depict two dragons emerging amidst swirling clouds, the fine craftsmanship of the present piece is reminiscent of the level and style associated with gold of the same period, and no other related example appears to have been published. Dragons represent high rank and power while two facing dragons traditionally symbolise a happy reunion. 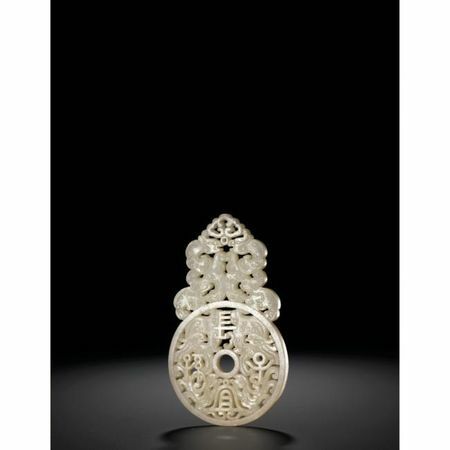 This piece may have been used as a hook and its curvaceous form appears to be loosely based on much smaller garment hooks of the Warring States period (475-221BC), such as one in the Museum of East Asian Art, Bath, included in the Inaugural Exhibition. 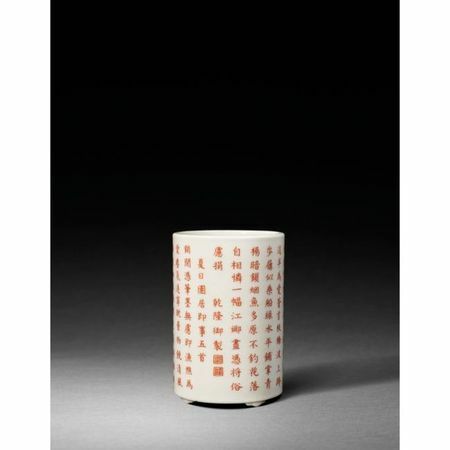 Chinese Metalwares and Decorative Arts, The Museum of East Asian Art, Bath, 1993, cat. no. 238. My heart feels deep concern. Who among the little ones is facing starvation? My son makes eulogies in praise of millet. In audience each sticks carefully to his own brief. 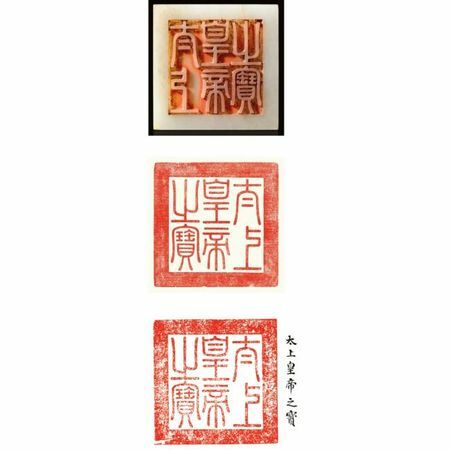 The depiction of two chicks is inspired by the famous painting Chickens Waiting for Feeding, signed and dated 1197, by Li Di (active 1163-1197), which is illustrated in The Complete Collection of Treasures of the Palace Museum. Flower, Bird and Animal Paintings of the Jin, Tang and Song Dynasties, Hong Kong, 2004, pl. 17. 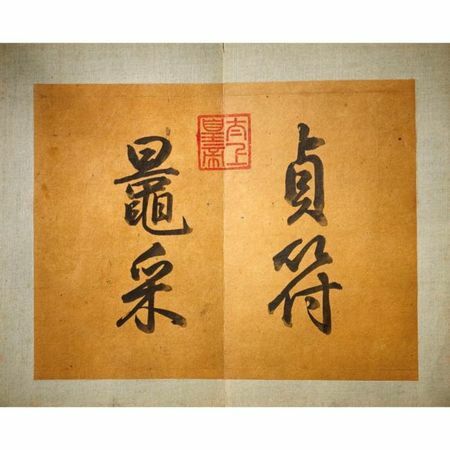 Li Di was a court painter in the Imperial Painting Academy of the Southern Song dynasty whose work was especially favoured by the Qianlong emperor. 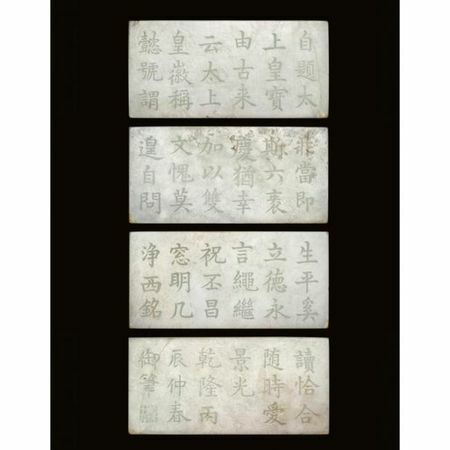 A copy of the Song painting, signed Hongli (the Qianlong emperor) and dated 1788, and a new version of poem were also transferred to stone so that multiple copies could be printed and distributed to the provincial governors. 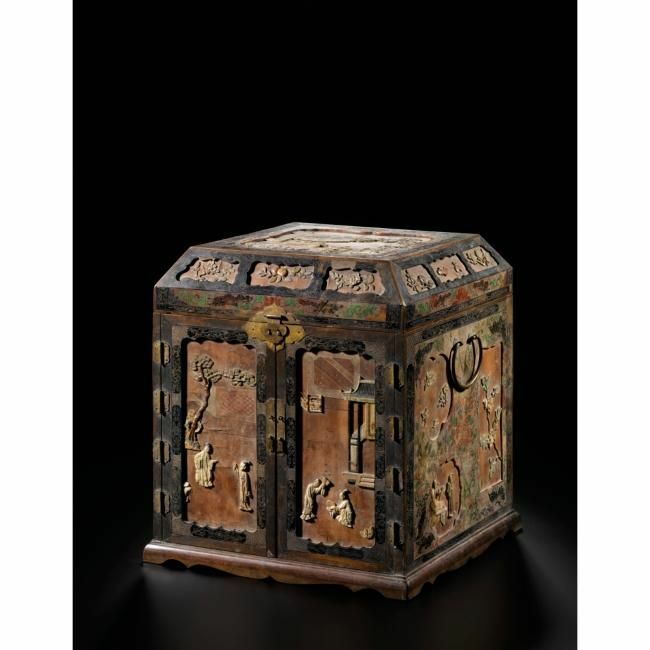 A zitan screen inlaid with a similar scene and carved inscription of a poem by the Qianlong emperor, dated to mid-autumn of the wushen year (corresponding to 1788) was offered in these rooms, 23rd October 2005, lot 386. 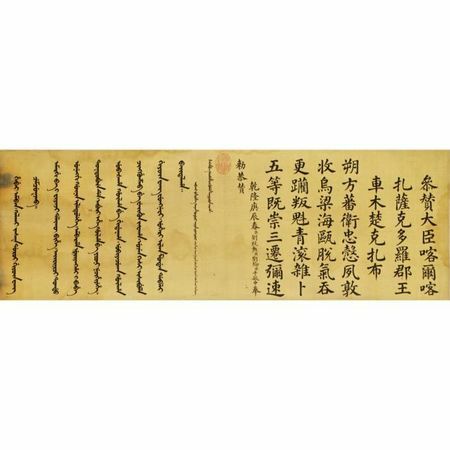 This poem expresses Qianlong's worries and concern for his subjects. Towards the end of his reign the emperor was faced with several problems, including the dramatically increased population of China, potential crop failure and famine in the country, an increasingly self-interested bureaucracy, and his uncertainty at his son's ability to reign effectively after his abdication. NOTE: The present disc of rings is carved from flawless white jade, the luminosity of which is accentuated by the restrained shallow carving, and no other example appears to have been published. 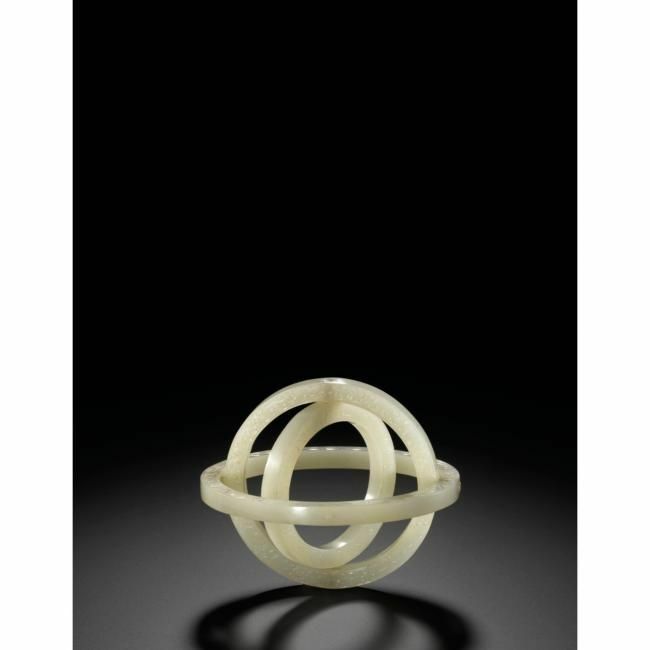 This piece appears to have been inspired by armillary spheres, a device that first appeared in China during the Han dynasty (206BC-AD220) to help understand the movements of the heavens. With Earth placed at the centre of orbit, the outermost ring, the meridian ring, was fixed in the north-south direction; the middle ring, the equatorial ring, was aligned to the earth's equatorial plane; and the innermost ring, the Chijing ring, had a sighting tube and could revolve around the single metal axis which was oriented to the North and South Poles. To use the armillary, the position of a star would be identified by pointing the sighting tube at it and reading the angles of the different rings. The four mountains on the meridian ring represent symbols and directions from the I Ching (Book of Changes), a compilation of writings and beliefs that predate the Xia dynasty. The inclusion of the symbols on the armillary and the constellations on the innermost ring shows the close ties between the traditions of astrology and astronomy in China. 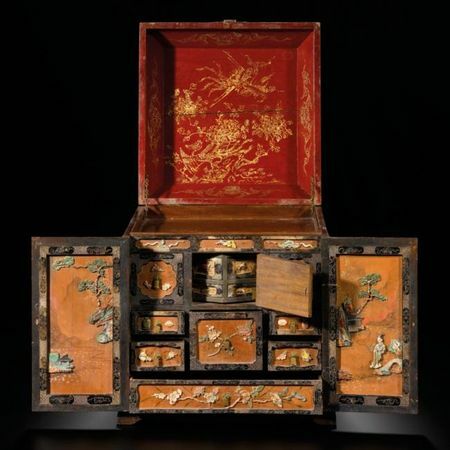 It was not unusual to find armillary spheres made of precious materials as objects d'art for the collection of the imperial court, which could be purely decorative or functional. 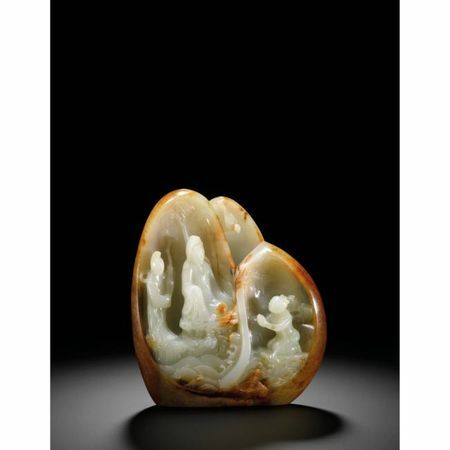 An important pair of white jade 'landscape' screens. qianlong.